For over 20 years, EW4D has been developing original technologies that redefine live event production. Capture your audience in events, trade shows, museums, retail and more with our cutting-edge digital solutions, including 3D holographic mixed reality displays, life-scale holographic presentations, and immersive holographic speaker support. Our award-winning creative and technical solutions for business meetings, trade shows, special events, product launches, press events, theatrical productions and award shows take you to the next dimension in special event technology and design. From corporate ballrooms, to museum theaters, to the trade show floor, EW4D’s holographic staging technology can take your imagination anywhere. Offering the same holographic projection experience as our large PG (Pepper’s Ghost) format, but on a smaller scale. Our modular PG-Stage is a proprietary design and protected by copyright. Ideal for fixed or temporary exhibitions where space is limited, but still wanting the detail and resolution as the permanent PG installations. The EW4D modular Stage can be disassembled and reassembled as necessary. The EW4D Modular Stage is a self-contained display incorporating 4K OLED technology, sound system, lighting & backdrop. Dimensions are approx. 10’H x 10’W x 10’D. 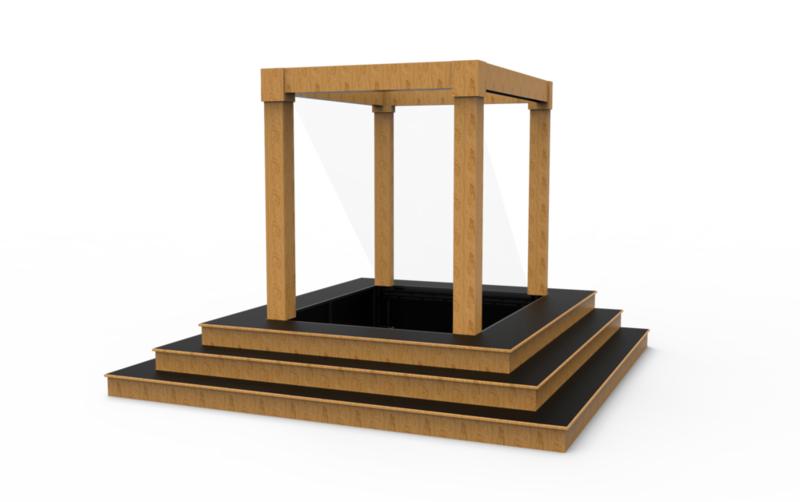 EW4D Modular Stage facing and detailing can be changed to meet specific requests. EW4D brought holographic technology to the Cleveland Clinic Foundation. EW4D designed and built a dynamic holographic theater at the ASTRO 2018 trade show for Accuray. Utilizing multiple visual imagery and EW4D's holographic presentation, those attending were treated to a most amazing visual experience. Watch the video below for more. Holographic technology using on-stage holographic screen projection. MetroHealth Medical Center's Annual Stakeholder's Meeting produced for holographic stage projection and on display forever through Dreamoc mixed reality displays.